Hi I’m Adam Cohen aka DaDa Rocks and I’ll be your cruise director. I’ve always wanted to write it and think that this will be a good time to introduce the humor that will be inline with the posts I publish on DadRevolution. The revolution is not just a movement but its also a state of mind. This new mindset is so clearly seen in the eyes of tired new dads, its the idea that I’m over my old life and this new life will involve this amazing new child. I’ve always been a fan of kids… I’ve been camp counselors, tutors, babysitters, so when it was time to start planning with my wife the life that our child will lead I was dancing on the ceiling. Its been a dream of mine to build a better fatherhood community, I feel there is giant lack of community activities availbility for dads… we’ve all grown up hearing about mommy and me classes, its only very recently that I heard the phrase daddy and me. I think it talks to the changing roles/dynamics of the cultures in which we live. There used to be no other role for a father but to go to work and come home and be the provider, now we have come to a point where there are stay at home dads, work at home dads, and some parts of our culture require two family incomes in order to survive. I’m a big believer in community as I talked about there is support, there is unity, there is a common thread we all share… This shared experiences makes us a community. The question is how to form the community while in some neighborhoods that will be meeting up in other communities it’ll be done in an online experience. I thinks been the best part of the internet for me is finding similar/like minded people across the country (if not the world). In the end I hope our revolution will transcend the virtual space and be we will one day be able to serve punch and pie at a meetup. Who is DaDa Rocks? I’m Adam Cohen. A native New Yorker (born in Manhattan), professional web programmer/designer, information architect, and all-around techie. I graduated from Rochester Institute of Technology with a BFA in New Media Design & Imaging. 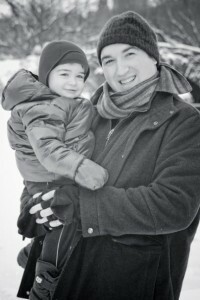 I’m father to Marc (now 22 months old) and husband to up and coming photographer, Suzanne Cohen. View all posts by DaDa Rocks!